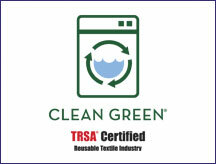 Tulsa, Ok. — Linen King has received TRSA Clean Green Certification from the Textile Rental Services Association (TRSA), the industry’s highest recognition of leadership in sustainability and conservation to protect the environment. TRSA is an international organization representing companies that supply laundered garments, uniforms, linens, floor mats, towels and other products necessary for businesses to operate safe, clean facilities, serve their customers and provide a clean, attractive environment and image. As a neutral third party, TRSA inspections acknowledge a textile service company’s continuing commitment to improving efficiencies and adoption of best management practices for reusing, reclaiming and recycling resources. For more information about the TRSA Clean Green Certification, visit www.trsa.org.